One of the most important items in your kitchen is your kitchen knife set. You can make a lot of food without a good set of knives, but you’re extremely limited on preparing high-quality healthy foods, like salads, stir-fry, or even homemade spaghetti. Because knives are so vital, it’s important to find the right knife for your kitchen. To make that a little easier, we’ve pulled together some information on knives, how to care for them, and a specific review for the Wusthof chef knife. What Are Kitchen Knives Typically Made Of? There a large number of types of kitchen knives used for a wide variety of purposes. Some knives are much more all-purpose, while some are extremely specialized to deal with cutting precise types of foods. A common knife in the kitchen is the chef’s knife. Almost every kitchen will have one of these, even if the owner of the kitchen doesn’t know what the knife is for. Chef’s knives are used for the most basic of food preparations, like chopping vegetables and fruits, and slicing meats and cheeses. They can also be used for creating a reasonably fine dice or mince. Chef’s knives come in a variety of different sizes, though each size ultimately perform the same tasks. Generally, the size of the chef’s knife is more about accommodating the size of the chef’s hand rather than the specific type of task. The paring knife is one of the smallest knives you’ll find in the kitchen. The blade is rarely more than four inches long. The size makes it ideal for coring and peeling vegetables and fruits. Paring knives are also used for making garnishes. Paring knives must be kept very sharp to avoid accidents that come from dull blades. Too much pressure on a dull knife often results in the user getting injured because the knife slips and cuts the user. A carving knife is usually larger than a chef’s knife. Carving knives have a similar shape to the chef’s knife. They can be very rigid, or very flexible, however, depending on their specific designed intention. Cutting a pot roast, for example, requires a rigid blade, while cutting pork is best done with a flexible blade. Usually, carving knives are used in conjunction with carving forks, used much the way a dinner fork and knife are used to hold food in place and cut. The oyster knife is used for prying open oysters, and separating their meat from the shells. This process is known as shucking oysters. The blades for oyster knives are usually short and thick, and the handle is similar, with a bulbous end. A deveining knife, or deveiner, is a small knife that’s designed for removing the “vein” or colon from the back of a shrimp. Another knife with an obvious use, the salmon knife is used for slicing and preparing raw salmon. This is often considered one of the critical knife styles for those who make sushi or other fish dishes with any frequency. The sashimi knife has a long, thin blade, and is used to prepare raw fish and other seafood, like octopus or squid. There are different styles of knives within the sashimi knife, including both the Tokyo knife, which has a rectangular end, and the Osaka knife, which has a pointed end. The different styles are designed for working with specific seafood items, like octopus or fugu (blowfish). The blade length of a sashimi knife is suitable for filleting medium-sized fish. There are other knives that are designed especially for cutting large fish like tuna. Bread knives are long, thin and have serrated blades to cut through soft bread without crushing it. Bread knives are usually between six and ten inches long. The Santoku knife has a straighter edge than a chef’s knife blade, thinner spine, and blunted tip. They usually run five to seven inches long. True Santoku knives are well-balanced, flat-ground, and lighter and thinner than Western versions of the knife. Santoku knives are used for easily slicing thin-boned and boneless meats alike, along with vegetables, and fish. The utility knife is somewhere between the chef’s knife and the paring knife in size, between four and seven inches long. The utility knife is less popular now than before, as it is so general that people often prefer knives designed more specifically than utility knives. Tomato knives, as the name suggests, are ideal for slicing through delicate skinned produce like tomatoes and plums. Kitchen knives can be made from a variety of materials, including ceramic, carbon steel, stainless steel, high carbon stainless steel, titanium, or even plastic. There are multiple ways to sharpen a knife. Today, we’ll focus on using a whetstone for this purpose. Before you can sharpen your kitchen knives, you’ll need a few supplies. Now, you’ll plunge the whetstone in standing clear water until no air bubbles pop up. A whetstone is porous, so it will need to fill with water to avoid the blade from catching on it as it sharpens. You’ll want to keep the whetstone wet throughout the process of sharpening, so be sure to keep the bucket of water handy. Once the whetstone is thoroughly wetted, you’ll remove it and place it on a non-slip surface, in this case, a damp towel. Make sure the stone won’t move while you sharpen. Splash a little water onto the whetstone, coarse grit side up. Getting the degree precise will probably be difficult, but shoot for 22-degrees. Perpendicular to the stone would create a 90-degree angle. Angle the blade halfway between the stone and that 90-degree angle, and you’re now at 45-degrees. Repeat the action, bringing the blade halfway between the 45-degree angle and the stone, and you’re approximately at 22-degrees. Whether you’re left or right handed, you want to hold the knife with your dominant hand as you sharpen it. Have your index finger on the edge of the blade, almost to where it meets the whetstone. This provides control and keeps the edge down as you work. As you work this side of the blade, you’ll need to keep track of the number of passes you make on the blade. You’ll repeat this same number on the other side of the knife when it’s time. Now, spread the fingers of your other hand across the back of the blade, applying more pressure across the whole blade to keep it down into the stone. These fingers will be your guide and anchor, keeping the blade down and moving smoothly across the whetstone as you go. Throughout the process of sharpening your knife, keep the angle of the blade even across the whetstone. Your motion should be fluid and smooth, as if you’re slicing off a thin piece of the stone. You’ll need to splash some water over the whetstone every few minutes to keep it wet enough to not snag the blade of your knife. Repeat the process as needed until your knife is sharp and even across the whole edge of the blade. Now, you’ll flip the knife over, and repeat the process on the other side of the blade as well, making the same number of passes as you did on the other side. If you don’t keep track, your blade will become misaligned and uneven. Now, switch to the finer grit side of the whetstone, and alternate sharpening each side of the blade. Make a pass on one side, then flip the knife, and make another pass on that side. Keep the angle and motion consistent throughout this stage of sharpening as well. Now, take your sharpened knife, and slice down the edge of a wooden cutting board, as if you were trying to cut into the wood. You just need to do this once, and then drag the blade back across the cutting board edge to clean off the edge of the blade. The final step is honing the blade. You’ll use your steel honing rod for this. Take a few passes on each side of the blade, to ensure that the blade is properly aligned. Continue to hone the blade of the knife every time you use the knife from here on out to keep it sharp and safe. Today we’re looking at the Wusthof 8-inch hollow-edge chef’s knife. The Wusthof chef knife has an eight-inch blade that’s forged from a single piece of specially tempered high carbon alloyed steel. This knife should be strong, easy to maintain the sharpness on, and dishwasher safe – though hand washing is always recommended for fine knives. The Wusthof chef knife comes with a limited lifetime warranty from the manufacturers out of Solingen, Germany. 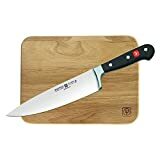 The Wusthof chef knife receives 4.9 out of 5 stars at Cutlery and More, 4.7 out of 5 stars at Amazon, and 5 out of 5 stars from the Home Shopping Network patrons who have made verified purchases of this knife. There were no reviews below 4 out of 5 stars for the Wusthof chef knife. The only potential negative we might see is the price range. $$ is quite reasonable for such a fine, high-quality knife, but some stores charge significantly more for this knife than others. Our recommendation to avoid this overpricing is being willing to wait for sales and special deals and being willing to have your new knife shipped from an online store, since many in-store purchases may cost more. Across the web, we found the Wusthof chef knife ranging in price from $$ to $$$ from sites like Cutlery and More, the Home Shopping Network, Williams-Sonoma, and Amazon. The Wusthof Chef Knife, 8-inch hollow-edge is a fantastic knife that would only enhance your kitchen. With no negative reviews on the sites we checked, we feel confident in recommending this knife for pretty much anyone to use. Be sure to check around various sites and stores to find the best deal, and, if possible, wait for the right sale to go on before purchasing. Using your sharpening and honing skills to keep the blade sharp and safe, and the Wusthof chef knife should last for a good many years of use. We highly recommend this knife to anyone looking for a solid, high-quality chef knife. The Wusthof Chef Knife is the perfect knife to get going into your kitchen. The knife should be strong since it's made out of high-carbon stainless steel. It also has an edge technology which makes each side sharper. Though it's quite pricey, it is definitely worth it!